Main » 2010 » May » 1 » Neu! - 1972 - Neu! ...the group Neu from Dusseldorf was certainly an extraordinary duo with many brave and innovative ideas. Michael Rother and Klaus Dinger came together late in 1971. Dinger had recently contributed to the first Kraftwerk-album. In December 1971 they recorded their first album over four nights at Windrose Studios in Hamburg, with Konrad Plank producing. Tracks like "Hallogallo" were guided by a characteristic, repeating metronomic drum beat, as the basis for 10 minutes of harmonic guitar improvisations in just one key. This music naturally paid homage both to Kraftwerk's klingklang music and to Can's 'live in the studio' works. Other tracks had strange continuums of rural environment sounds, glissando guitars, peculiar vocals and sound effects. All together a rather naive and playful form of avant-garde music, resulting in a very original album! However, Neu 2 (1973) merely repeated this formula. Side one had a classic Neu track in "Fur Immer", sounding very close to the previously issued "Hallogallo" On side two, the A and B sides of a 1972 single ("Neuschnee" coupled with "Super") were the subjects for tape manipulations of different sorts - slowed down, speeded up or dubbed (and with pre-recorded vinyl scratches and noises added)! 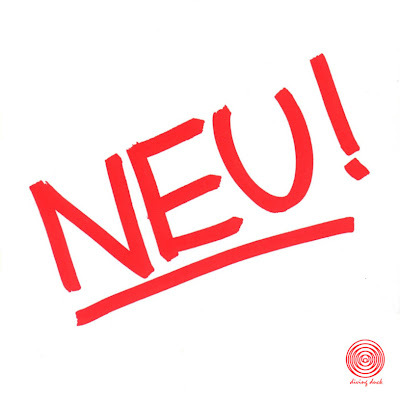 If Capitol made nine US albums out of five UK Beatles albums, Neu taught the music business other ways to stretch a single all over an-LP's side! It's not a bad album, but a little superfluous when compared with their first. Attempts to present Neu live (with ex-Guru Guru member Uli Trepte on bass) in November 1972 were terminated after 6 concerts. Michael Rother then began to work with the Cluster duo as the trio Harmonia, resulting in the albums Musik von Hiarmonia (1973) and De Luxe (1975). Klaus Dinger on the other hand used the spare time attempting to launch his own label, named Dingerland. This project was ill-fated, but he managed to release an album with the rock'n'roll group Lilac Angels. Then, in 1975, Neu resurfaced as a quartet of: Rother, K. Dinger, Thomas Dinger and Hans Lampe. Neu '75 was a brilliant album, succeeding in making their music more accessible. A charming and tuneful example of the very special "klingklang" Dusseldorf rock and a link between the early Kraftwerk works and the forthcoming neue Deutsche Welle. When Michael Rother went off to make a second Harmonia album and then pursue a solo career. Hans Lampe and the Dinger brother changed their name to La Dusseldorf, and explored the melodic Neu '75 sound further on their subsequent albums.